Digital collage created from original photos of American crow, archway at Hatley Castle (Victoria, B.C.) and top of entranceway at Empress Hotel (Victoria, B.C.). Loved your arch.Poor old poe ,But we well always think of him.Great job on your arch this week Gorgeous!! Your arch looks great, very classic and interesting in its simplicity!!! A very compelling arch...Love it! Oooo...you know I like all things Poe! This is wonderfully dark and gothic..Well done! 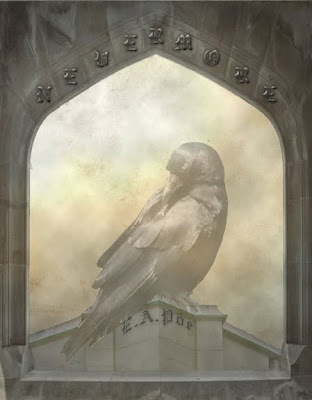 Lovely gothic entry here- beautiful image and tribute to Poe! wonderfully creative in its simplicity! well done! WOW this is just so stunning, Catherine! Amazing interpretation of the theme. Wow, this is fantastic! I like how you put the words over the arch. Great idea and design. Whoops--didn't read the other "stunning" comments before I said that--well, it IS very striking! this is fantastic! I love the rich feel of it!